At Battersea Cats and Dogs Home, a cat will stay for an average of 23 days before they find a new home. Unfortunately, Twizzle’s stay has exceeded this by 102 days and with his birthday wrapped up, the staff are really hoping for a miracle to help him. The “intelligent and playful” moggy has been patiently waiting a heartbreaking total of 125 days for a family to take him in and love him. 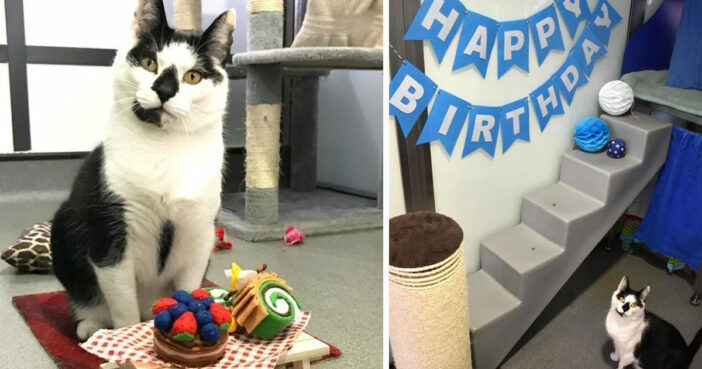 Twizzle is a loveable and good-natured cat who recently turned eight years old and staff who dubbed him ‘Britain’s loneliest cat’ are hoping he will will soon get the gift of a new forever home. Please help us share to find this beautiful cat a home!